Petroleum systems exploration: is it ever advantageous for your business to share what you know? The perceived value of petroleum systems naturally evolves over time in response to variations in both global and local, supply and in demand. 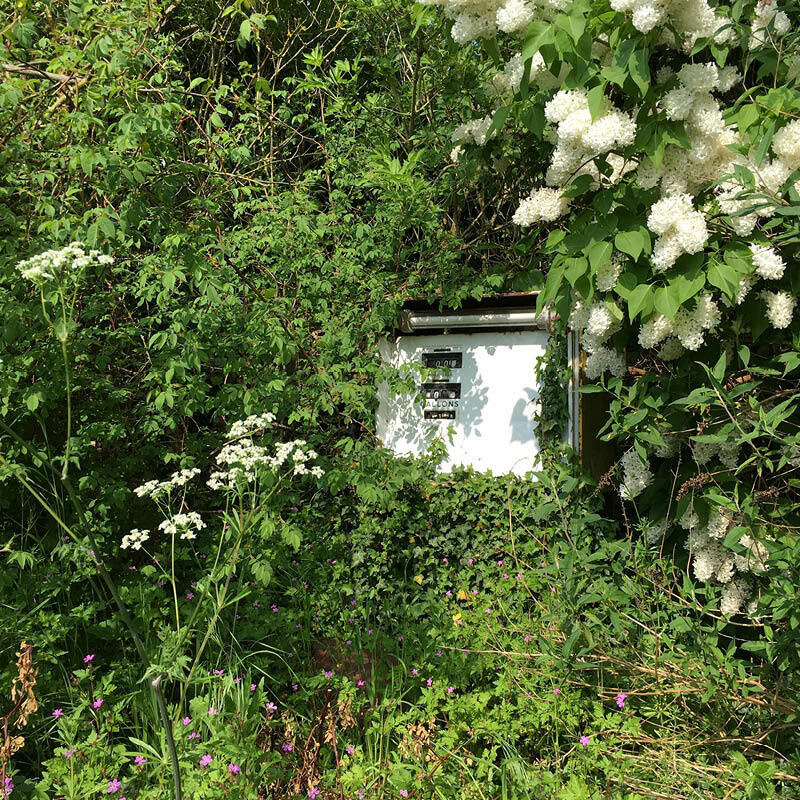 Less recognised is the fact that the commercial landscapes of basins also evolve as they mature from frontier settings to mature producing assets. Late in the productive life of an asset the focus is frequently directed towards maximising returns from existing bread-and-butter plays, resulting in the loss of divergent thinking, which can stifle play innovation and the potential for new volumes. However, the abundance of remaining resource potential in mature assets means that any incremental volumes have the capacity to add significant value on the basis of extra production alone. The same earnings potential also exists for operators just by delaying decommissioning of asset infrastructure, offering substantial savings in ‘money of the day’. Finite resource creaming as an expression of exploration maturity over a range of 20 – 120 years. 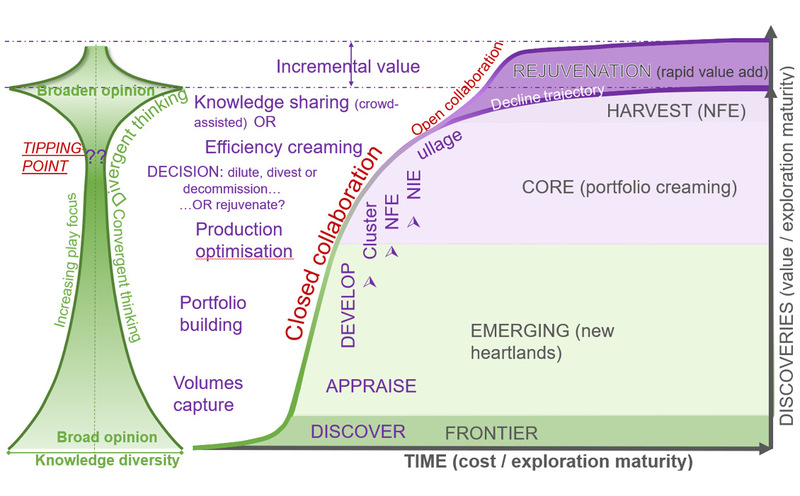 The diagram above presents a standard play creaming curve on the right, where exploration investment over time leads to new discoveries, a portfolio of undiscovered potential, production and related infrastructure development and, with time, exploration maturity. New discoveries begin with broad play perceptions, which converge as exploration matures. The left of the diagram postulates that a natural, though diffuse, tipping point exists as the perceived end of productive life of a petroleum system approaches, where decisions need to be made about dilution, divestment or decommissioning – in other words, a declining resource. The alternative to decline is to rejuvenate the portfolio, extending the life of a petroleum system by creating new opportunities. This article focuses on the role played by knowledge in opening up new innovative business possibilities, whether technically or commercially inspired. The premise is that closed collaboration sets the decline curve to decommissioning but that open collaboration has the potential to rejuvenate a tired petroleum system. In 2014, the Wood report examined in detail the measures required to rejuvenate oil and gas production from the United Kingdom Continental Shelf (UKCS). The report placed an emphasis on “far greater constructive collaboration between operators” across the business life-cycle. Wood’s recommendations are not only relevant to the UKCS; they apply equally to the rejuvenation of all prolific petroleum systems approaching the end of their productive lives. Why the emphasis on collaboration? After all, collaboration is an integral part of day-to-day petroleum exploration, which works so long as it does not compromise enterprise confidentiality. Collaborations, whether formal JOA’s or ad hoc data trades, are tightly controlled quid pro quo transactions that carefully navigate around perceived anti-trust behaviours to protect valued intellectual property. Exploration risk can also be mitigated by broadening the portfolio with additional assets via swaps or new block additions, assuming no risk dependencies exist between the new and the old assets. Optimising risk in this way involves a minimal degree of knowledge sharing. Such transactions are closed forms of collaboration between carefully selected entities, with clear value of information controls to protect intellectual property. Open collaboration however, through an exchange of data or knowledge, is a completely different transaction and one that challenges conventional views of enterprise-focused approaches. The difficulty with collaboration, from an enterprise perspective, is that the value of knowledge sharing is hard to quantify, especially when compared to the perceived value lost from such activities. Collaboration for success is the future of oil & gas. Each enterprise has its own asset plan with a clear abandonment schedule - unless of course, there is a jump in the time-value of the asset. The problem is that the timing of abandonment moves forward whenever technology, technique or just luck generate additional future value. Seneca is often quoted as having said, ‘Luck is what happens when preparation meets opportunity.’ So how can enterprises prepare aging assets to take advantage of value-adding luck? This is when collaboration through a more open exchange of knowledge might become a new value-driver; one which requires a conscious shift in enterprise focus away from solely self-sourced value opportunity dynamics. Throughout the petroleum system life-cycle, enterprises regard knowledge, together with their own detailed assessments of prospective resources (PR), as closely guarded secrets not to be leaked. Towards the perceived end of the productive life of a petroleum system, the growth rate diminishes as play concepts are exhausted: success rates generally increase but volumes found decrease as the remaining value is squeezed out of well-understood plays. Holding onto knowledge at this critical time results in enterprises generating their own views of PR based on plays that have been worked to the point of exhaustion. There is no question that proprietary knowledge is one of the keys to unlocking frontier, emerging and core basins because active competition drives activity, leading to investment and value creation. But as the opportunity landscape narrows with increasing exploration maturity, the inevitability of decline can stifle innovation. This is when sharing knowledge might become more advantageous to your business than concealing it. A common example of what happens with a lack of knowledge sharing is the value destruction that comes when multiple operators test the same flawed play concept, unaware of what previous wells were really targeting or what had been found that alters the play concept. History tells us that enterprises in any sector that look constantly inwards seldom thrive. External awareness such as competitive intelligence is essential for the continued health of an enterprise. There are a number of ways available to the oil and gas sector in which knowledge can be sourced externally to broaden the college of opinion. Consultants are very good at providing new insights in areas where internal knowledge levels are low, but they are not so effective in near ‘end-of-life’ conditions, where a much more diverse source of knowledge is required than just adding more consultants. Expert networks, for example, allow companies to access a pool of knowledge holders through an hourly-charged interview approach. The enterprise with the knowledge deficit controls the inflow of knowledge specifically to cover known gaps with the likelihood that the process will also reveal other deficits previously unknown. This is an extremely efficient and cost-effective way to broaden opinion in core basins, allowing knowledge to flow in one direction (towards the enterprise), while putting legacy knowledge to very good use. Unfortunately, this approach often results in ‘you get what you ask for’, whereas, late in the life of an asset, what is often needed is a concept that the interviewer may not consider querying. 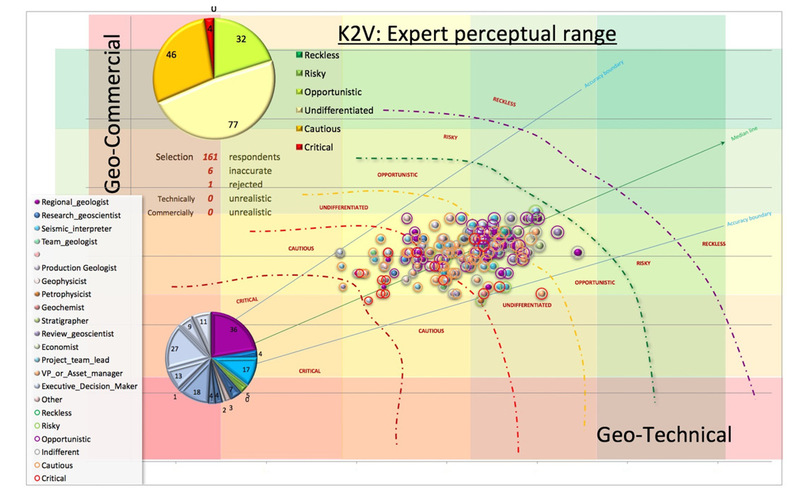 These results from a recent experiment plotting geo-commercial versus geo-technical observations from a simulated data room show how evenly the opinion of 161 verified experts is spread between the cautious and the opportunistic viewpoint. Recent experiments, illustrated above, have shown that crowdsourcing expert knowledge preserves the diversity of opinion while setting realistic boundaries on value potential (i.e., what we know about a basin, not necessarily what is actually there) and is a powerful force for levelling the playing field for new entrants to an area. However, for effective mature basin rejuvenation, the range of potential plays to review needs to extend beyond conventional wisdom, allowing consideration of plays being pursued elsewhere on a global basis that might be transferable to an individual asset. The handful of supermajor multinational upstream companies, with their large staff pools and history of diverse assets, might attempt such brainstorming using only internal resources to stimulate innovation. But while such an approach might work, those seeking new ideas may find it simply reflects back recent corporate history (which may have already been considered), rather than a more globally diverse set of concepts. This problem is made worse by the current high turnover of experienced staff during the recent industry downturn. The first step to acquiring a broader college of opinion is for an enterprise to recognise that its staff, or any small group of consultants it might choose to employ, will probably not have the range of ideas that it needs to consider when trying to decide whether to abandon or extend an asset’s life. Professional networks will probably include members with appropriate content knowledge, but how does one pose a question about what is unknown and still access the key knowledge holders? The answer lies in two-way crowdsourcing. Asset economics includes the cost of decommissioning infrastructure. © K2V. So where can the range of experiences required for two-way crowdsourcing be found? The only public tool available to visualise the spread of knowledge in confidence is the Knowledge PinMap™. Participants are invited to stick a pin on a map wherever they have acquired knowledge or to identify plays where they have developed expertise. This tool is free and non-profit making but it has the capacity to increase visibility that might lead to future compensation. Collective opinion can be achieved through open collaboration between individuals, not entities. Those individuals who have an obligation to protect the confidentiality of their enterprises, even if their entries remain anonymous, should seek formal permission before participating. Soliciting industry-wide knowledge has not been attempted before in the oil and gas sector and could play a key role in rejuvenating tired petroleum systems. Crowdsourcing knowledge is the fastest and cheapest way to open the discussion and the tools to facilitate discussion are already in use. 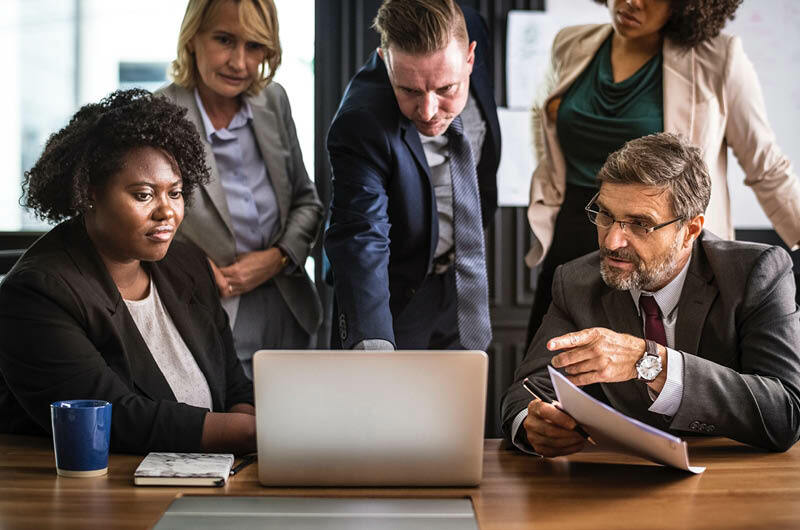 Whether or not you believe that sharing knowledge has the capacity to benefit your bottom line, it is important for enterprises to recognise that realising the full potential of an asset is not only important for that enterprise. Getting the most out of a producing asset is also essential for their public stakeholders, which includes regulators and the citizens they represent who are both involved in the scrutiny of late-life asset plans. Decommissioning platforms is a costly undertaking. This is the hull of the Hutton tension leg platform, which was installed in 1984 at the Hutton oil field in the East Shetland Basin in the North Sea; it was originally designed for a service life of 25 years. 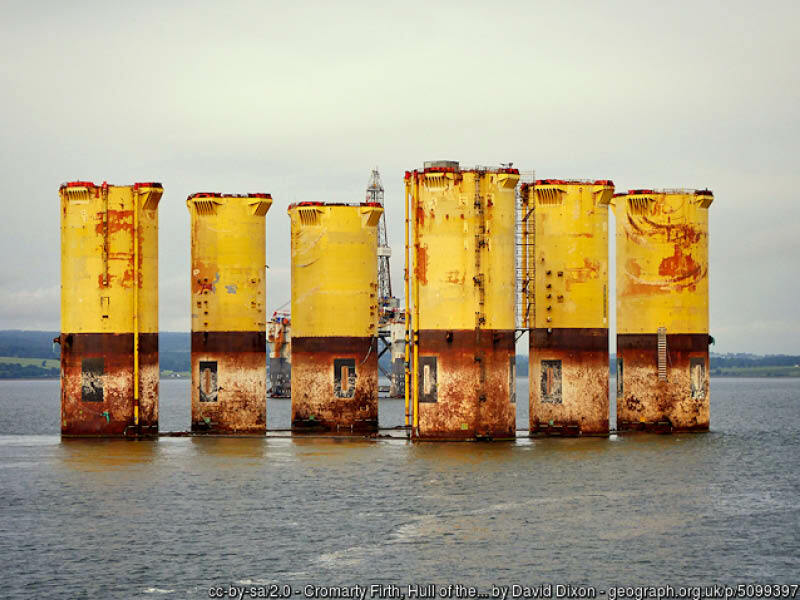 After decommissioning, the platform was removed for re-use outside the UK, but the hull has been a permanent fixture in Cromarty Firth in Scotland since 2009 Knowing when to let go in basins that keep giving is one of the hardest decisions to take, partly because of the cost to the business on decommissioning and partly because of the concern that additional value-generating opportunities may still lie hidden in a block. The lack of shared knowledge means that the industry is not able to learn from mistakes made by peers and that the remaining PR is both unrecognised and unachievable, which erodes value even further. By crowdsourcing opinion and shaping that into a commonly agreed inventory of prospective resources, the rejuvenation process connects knowledge to value. The method proposed here requires sharing knowledge to achieve a common understanding of value through open collaboration. Rather than attempting to change corporate cultures and behaviours to alter enterprise dynamics, open collaboration can be achieved between individuals without undermining business integrity using tried and tested crowdsourcing techniques. A related and powerful message to stakeholders would be for operators to demonstrate responsible asset husbandry by sharing knowledge where it has maximum impact for all involved. Wood, Ian, 2014 – UKCS maximizing recovery review: Final report. Public domain document.